Bad Kitty Glass is owned and operated by Teresa Soito in Oakland, California. Teresa has dabbled in the arts from an early age. Winning the “Put Litter In Its Place” poster campaign in the second grade set her on a path of exploration and discovery. Exposed to painting and photography by her artist father Vern Soito, Teresa has experimented in both mediums. In between academic classes at UC Berkeley she found time to study photography and darkroom techniques. Other creative outlets have included cake decorating and design as well as clothing patterning and construction. Let’s not forget about the macrame. 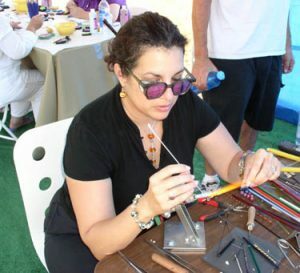 Jewelry fabrication has always been in the mix. Teresa was introduced to the art of lampworking by her friend, glass artist Kathleen Mitchell, in 2001 at the UCSD Crafts Center in La Jolla, California. She fell in love with it and continued studies with glass artists Joyce Rooks and Loren Stump. She also had the pleasure of teaching lampworking at the Crafts Center and is a member of the Glass Art Society. Collectors love Teresa’s ‘Bad Kitty’ animal print beads, but her inspiration comes many sources – the greens of trees as sunlight alights on leaves, the iridescence of fish gliding through water, the ‘it’ colors of fashion and rock ‘n roll, and new color schemes observed in her world travels. The process is exciting. Every bead is unique, even when working with a design already in the Bad Kitty Glass line. When sitting at the bench Teresa can’t predict exactly what will emerge. The beads change with application of heat from the torch, then again based on the metallics and color and other properties of the glass, and finally during the annealing process in the kiln. When the beads come out of the kiln Teresa may take some time to determine what they’re going to be when they grow up. They are grouped together, design ideas are entertained until the decision is made and the beads are fabricated into the jewelry pieces. Incorporating items found around the world: sterling silver, chain, leather and satin, plus one-of-a-kind glass beads, Bad Kitty Glass jewelry is truly unique. Embrace your inner Bad Kitty with earrings, bracelet, a necklace or complete set. Custom orders welcomed, thank you for visiting!